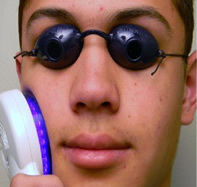 Deep penetrating light hand-held far infrared led light therapy device for acne. FDA approved for mild to moderate acne. Acne is a problem for people of all ages, gender and race, and for those who live with acne, it can be agonizing and tormenting. Unfortunately, acne can also be very persistent, unless you have the right knowledge and tools to clear up the condition. Bacteria Infection - Skin cells, sebum and hair clump together into a plug, then the plug gets infected with bacteria, resulting in a swelling. Face Touching - If you have the habit of touching or rubbing your face with your dirty, potentially germ infested fingers, you transfer the dirt and germs to your skin, which often leads to clogged skin and breakouts. Poor Hygiene. The oil in our skin (sebum) causes the pores in our skin to become clogged resulting in pimples, blackheads, whiteheads and even cysts. Clear skin requires that you wash your skin at least twice a day, using a non-toxic cleanser designed for problem skin. And never, ever go to bed with makeup on your face. Imbalanced Hormones. Sebum is increased when hormones are intensified; which explains why teens are more prone to get acne and why women suffer from more acne breakouts than men. Poor Diet - If poor food choices can lead to an unhealthy body, it stands to reason that they also lead to unhealthy skin, despite what naysayers believe. “A diet with a high glycemic index – basically, processed foods like bread and refined grains that are quickly broken down into sugar – can have a terrible effect on skin,” says New York City dermatologist Dr. Francesca Fusco. "The theory is that refined carbs cause your insulin levels to spike, which in turn leads to increased sebum production and clogged pores." Liver Congestion - The main role of the liver is to detoxify the blood when it comes from the colon, lymphatic system and lungs. After the blood has been detoxified it supplies the body with oxygen and nutrients. When the liver builds up with toxins from alcohol, drugs, the environment and eating unhealthy food - toxins like heavy metals, pesticides, chemicals, etc. - it impairs its ability to remove the toxins from your blood. When the liver is built up with toxins, the toxins tend to leave the body through the skin, which causes acne and other skin disorders.